The Chevrolet Colorado is a two-door, three passenger compact pickup truck, and a four-door, six passenger compact pickup truck. Chevrolet is a name forever tied to pick up trucks in the United States, be they small, large, or anywhere in between. The company has played up their historical ties to American trucking heritage in several ad campaigns, and are extremely proud of the contributions they have made to this department of automotive history. While the glory has largely gone to their full-size pickups, Chevrolet has also offered a line of compact pickup trucks since the early 80’s. As the popularity of these trucks increased, so did their size - the Colorado, the latest generation of compact Chevrolet pickup (introduced in 2004), has dimensions that would most accurately be described as ‘mid-sized’. In addition to the bigger frames and cargo beds, these larger ‘small’ trucks also come with upgraded horsepower. For 2008, the Chevrolet Colorado can be had with one of two engine options. The first is a 2.9 liter 4-cylinder making 195 horsepower, and the second is a much more powerful inline 5-cylinder engine that displaces 3.7 liters and generates 242 horsepower and 242 lb-ft of torque. The latter provides the Colorado with the ability to tow 5,500 lbs. The 4-cylinder can be had with either a 5-speed manual transmission or a 4-speed automatic, while the inline 5 is only available with the auto. Like most of their pickup truck offerings, Chevrolet has divided the Colorado into 3 different body styles: Regular Cab, Extended Cab and Crew Cab. Each of these versions can be further subdivided into quite a few different trim levels, options packages and configurations, ranging from comfortable to barebones work trucks. The Regular Cab provides seating for 3 on a standard bench seat, and the base model is outfitted with easy to clean out floors and upholstery. The Extended Cab truck adds two additional, small doors and increases passenger seating to 6. Finally, the Crew Cab provides four full-sized doors to go along with increased interior room for 6. The Crew Cab is limited to a 5-foot box, while the other two configurations can be had with a 6-footer. The Colorado can also be equipped with the Z71 off-road package, which adds a locking rear differential, tinted glass, and an independent front suspension optimized for harsher driving conditions. The Chevrolet Colorado has undergone a considerable amount of refinement since it was first introduced, in order to keep up with the fast-moving pickup truck market. 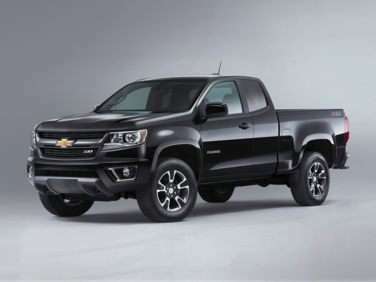 The truck has fared well competitively in the past against both the popular Ford Ranger and the Toyota Tacoma, but in order to keep their edge, Chevrolet has decided to introduce a new engine option for 2009. A 300 horsepower V8 will be available for some versions of the Colorado, making it the first compact pickup from General Motors to be offered with a V8, and bringing it into competition with the Dodge Dakota, which has long had a eight-cylinder engine on the option sheet. This 300 horsepower salvo is merely the latest weapon produced by Chevrolet in the unending compact truck performance battle. The 2009 Chevrolet Colorado is largely a carryover from 2008 in terms of its platform, but some trim levels have been dropped and a new V8 engine has been made available. The 2009 Colorado pickup can be had in either Regular Cab, Extended Cab or Crew Cab configuration. The base Regular Cab and Extended Cab start out with either Working Truck or 1LT trim, which comes with the choice of a 2.9 liter 4-cylinder engine that outputs 185 horsepower and 190 lb-ft of torque, or a 242 horsepower, 5-cylinder unit that churns out 242 lb-ft of torque. The former turns in fuel economy rated at 18 miles per gallon in the city and 24 miles per gallon on the highway, while the latter offers 17 miles per gallon in city driving and 23 miles per gallon during highway cruising. A 5-speed manual transmission or 4-speed automatic are the gearbox options, and four-wheel drive is also available. On the Extended Cab and Crew Cab, a 1VL value trim featuring the same drivetrain can also be had if four-wheel drive is excluded. Extended Cab trucks ordered in 1LT trim can avail themselves of either of the previously mentioned engines, or upgrade to a new for 2009 5.3 liter V8. This powerful engine generates 300 horsepower and 320 lb-ft of torque, and is exclusively mated to the 4-speed automatic transmission. Fuel mileage is rated at 15 miles per gallon in stop and go traffic and 21 miles per gallon on the highway. The 3LT comes with this engine standard, and is rear-wheel drive only. 2LT offers a choice of either the 5-cylinder engine or the V8. ***** The Crew Cab makes use of the same trim levels as the Extended Cab minus the 4-cylinder engine option when ordered with four-wheel drive.